Hastingwood Industrial Park has been created by the regeneration of derelict factory space. 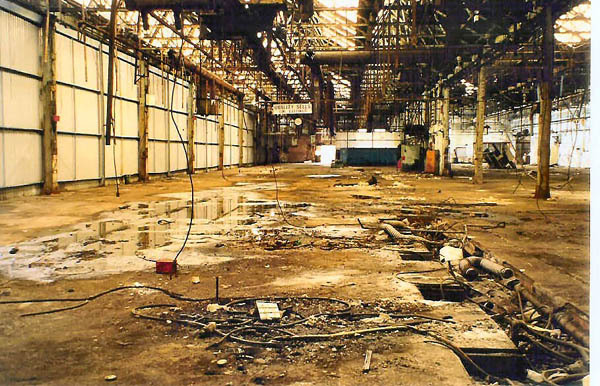 It stands on a 15 acre site in the Birmingham Heartlands region, which had previously been in use for many years for heavy industrial processes including foundry work and smelting. The site has been extensively refurbished and modernised over the last 4 years. 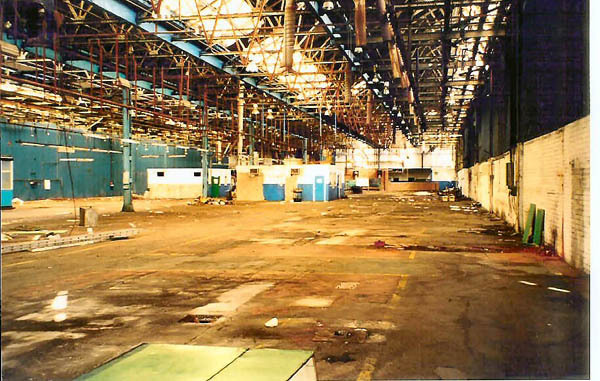 Until vacated in 2000, the site had been in continuous occupation by a succession of companies based mainly in the automotive industry. Famous names from the past include Automotive Engineering and SU Carburettors. Our neighbours still include Jaguar Cars, Fort Dunlop and a number of automotive companies who trade with some of our tenants � all famous names of the future we are sure. By means of a programme of selective demolition, we have improved car parking, circulation and access on the site to modern standards. A large number of small Industrial Units of various sizes have been created in the remaining buildings by a process of subdivision. The site infrastructure has been improved so as to provide a range of services and amenities. We provide electricity, gas, water, telecoms and internet connectivity to all our HIP tenants � a true one stop shop. The existing office accommodation on the site has also been remodelled and converted to a Business Centre whose facilities are available to both the Industrial Occupiers and to office based Tenants. The whole aim of this process is summarised by a few statistics. A derelict old industrial site comprising approximately 50,000 sm (550,000 sf) is being converted into approximately 33,000 sm (360,000 sf) of modern industrial and fully serviced office accommodation providing economic and attractive premises to over 200 small companies and business start ups. An attractive aspect of this regeneration is that the modern space created benefits from the original traditional building methods and materials and both amenity and character are very different from contemporary designs which seek to minimise construction cost. The original buildings were arranged in what was a conventional layout some 70 years ago. There were two large office blocks to the front of the site, behind which lay a single large building. This building, approximately 120 metres square, has 18 bays of North Light Roof on steel trusses with approximately 8 metre (27 ft) eaves height. To the rear of the site there is another large building of approximately 4,600 sm (50,000 sf) with a double pitched roof on steel trusses and with similar eaves height. These large buildings were flanked by a number of outbuildings and in total almost all of the site footprint had something standing on it. Almost the only concession to modern standards over the last 50 years had been the demolition of some of these original buildings to create a central car park � although this was totally inadequate by modern standards. An amusing incident took place when we originally purchased part of the site in 1999. A Director of the then occupiers took us into their Boardroom, one of the few parts of the site that could be explored in normal clothing. A display cabinet took pride of place, with scores of pistons and other automotive bits of British industrial history carefully arranged. The challenge was issued: "Can you tell the difference between that piston there and the one over here?". After a tactful minute's study, we admitted defeat: they seemed identical. "That one we sell to Rover for �3.50 and that one we sell to F*** for over �120 - that's the ONLY difference". With entreprenurial ability like that, why did it all end? The photographs shown here are typical of the conditions we found at the start of the project. 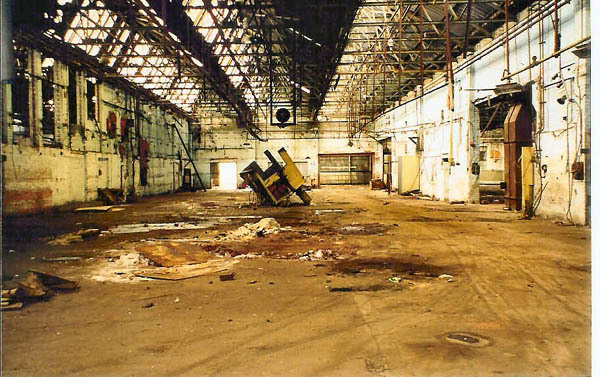 Even with our track record and previous experience there were times when it was all rather daunting � however, creating a successful working environment out of a derelict industrial wasteland gave us a lot of satisfaction.